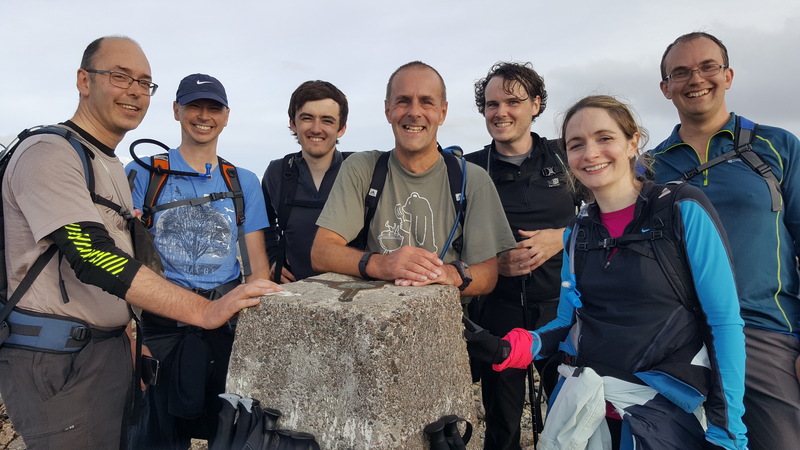 Many will be aware that last Friday to Saturday I joined a group of workmates from Fareham to participate in the national Three Peaks Challenge. 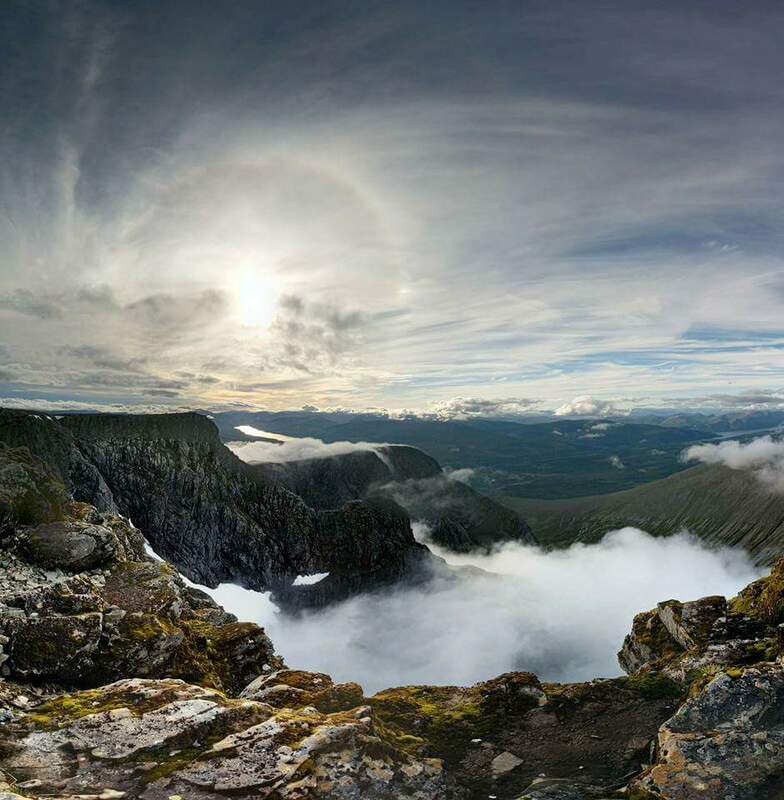 The objective was to climb the three highest mountains in England (Scafell Pike), Scotland (Ben Nevis) and Wales (Snowdon) within a 24 hour period. 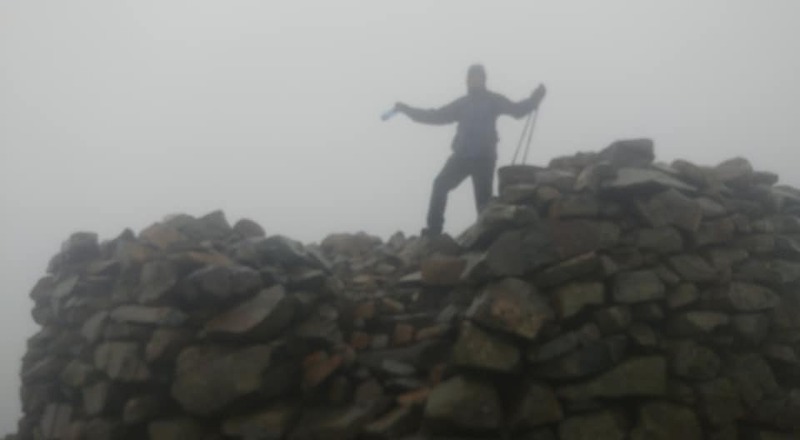 You may also know that I am quite familiar with this challenge having attempted it on three previous occasions; 2011 (completed within 24 hours), 2012 (completed within 25 hours) and 2013 (failed after crashing the car as we neared Scafell Pike). Each attempt has had its own positives and negatives but I particularly enjoyed this attempt especially given as the prep work had already been done…I was joining an established team! We were a team of 7 hikers (Alison, Chris, Simon, Nigel, Graham, Dan & myself) and we had two drivers (Michelle & Ben). We set out at 5am on Friday morning from Fareham (from the office of the group I joined). The long drive eventually brought us to Fort William in time to begin at 5pm on Friday. Initially the weather was quite cloudy but as you will see from the photos we came out above what clouds remained and enjoyed clear views in every direction. It was simply stunning. The first of our group (including me) made it down to the bottom at 9:55pm but we were not on the road again for another 30mins. As we travelled through the night to the Lake District the wind and rain drew in and we started a very wet Scafell Pike at 4:35am. Perhaps owing to the weather most of us completed Scafell Pike in 4hrs 15mins (the quickest I’ve ever done it) but again we were not on the road again until 5:45am as we waited for the remainder of the group. The final ascent began at 3pm and again the weather was wet and windy. In fact it was so windy (literally knocking me backwards) that we were unable to complete the third and final summit, turning back about 30mins from the top. At around 7pm (a full 26 hours from when we started) we began the journey home. 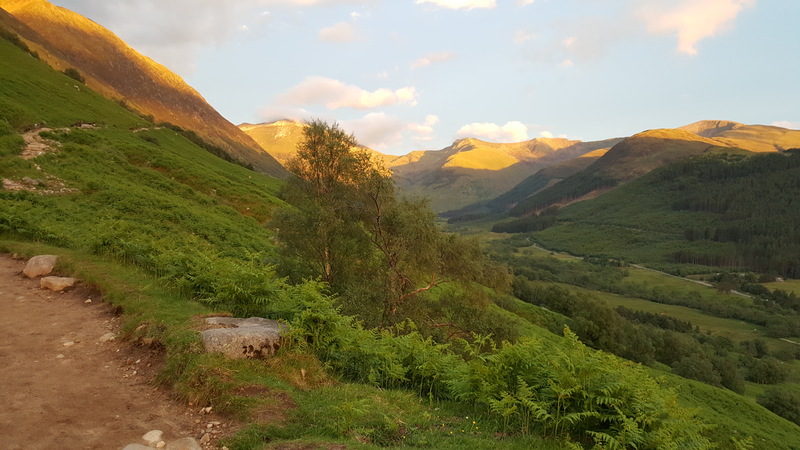 The Three Peaks are some of my favourite mountains and yet one would have to say that there are may factors which have a huge impact on the climb. Things like the weather, energy levels, how much sleep you have had and the particular stage of the weekend you are at all have a huge bearing on the experience. I am very much a fair weather hiker and I love to look out from the summit of a mountain and take in the views. 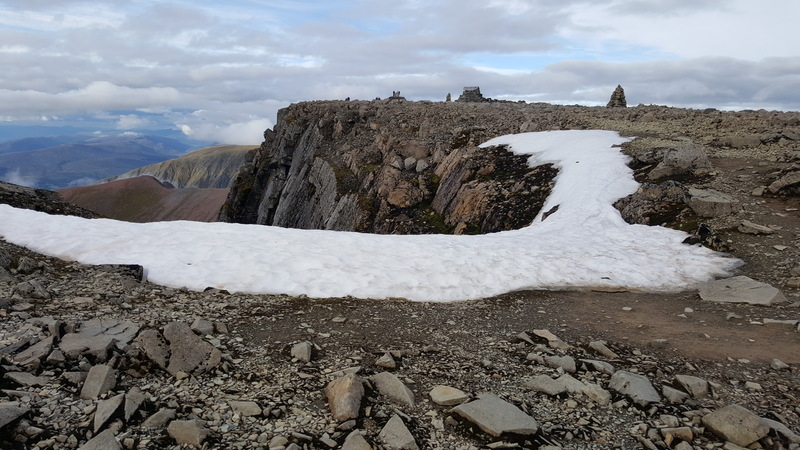 It was no surprise then that as the cloud lifted on Ben Nevis I had a burst of adrenaline that took me to the summit without haste. The views were fabulous (almost all of my photos came from this mountain) and for me that was by far the high point of the challenge. Interestingly Ben Nevis is the only one of the three peaks from which I have ever enjoyed clear views on the challenge itself! I would love to say that the other mountains also provided such views but that would be untrue. Part of the reason I had been so keen to do it was the hope that in doing the challenge a whole month later than usual perhaps I would enjoy great views throughout. The weather has been pretty good of late even either side of the challenge but for whatever reason at the moment we attempted to climb Scafell Pike and Snowdon the weather was pretty awful. It rained from start to finish on Scafell Pike and it was incredibly windy on top. 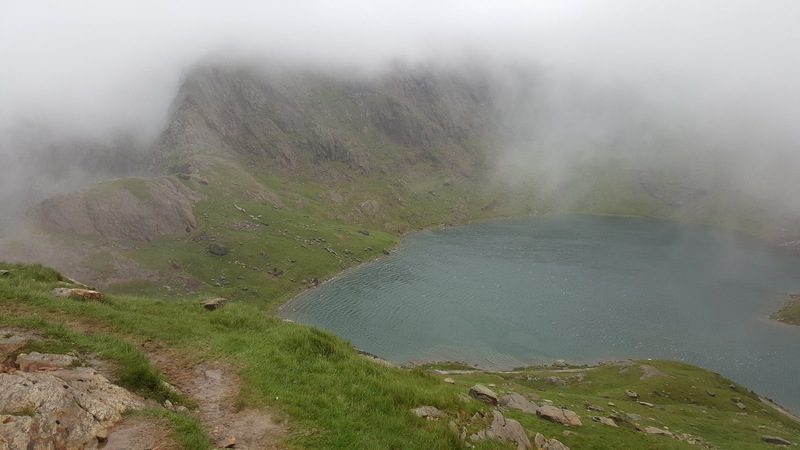 It also rained for most of the Snowdon Hike and the winds were almost certainly gale force! In lots of ways life is a bit like this. There are the high points when you feel like you are really flying but there are also the low points when you want to give up or you lose hope. After the heights of Ben Nevis (the highest point in the UK) it was very difficult to find the motivation to start out on yet another mountain especially in the wind and rain. Time and time again it is clear to me that God enables me to run and not grow weary and to walk and not be faint. God is my Hope, God is my Strength and He enables me to face all that life brings my way. I wonder what or whom it is that keeps you going when the pressure is on? The journey will not always be easy but for me I know that Jesus is always right there with me. My second observation is that when the pressure is on you just have to take it a step at a time. It requires perseverance, determination and focus. It is easy to be defeated by the scale of the challenge. When you are near the bottom the summit seems so very far away. You have to take it step by step or we would never continue. You have to focus not on the challenges of the moment but on the bigger picture. It is no surprise that the same is true in life more generally. When I get consumed by the scale of the obstacles that stand before I feel defeated and find it hard to keep on going. When I lose perspective everything begins to feel like it is too much for me. The writer to the Hebrews also uses this analogy to describe life as a race. The writer points to men and women of faith down the ages as a cloud of witnesses that go before us. There is no pressure, challenge or hardship that others before us have not already faced and come out of the other side. The writer urges us to run with perseverance and to do that we are told that we must fixed our eyes on Jesus. He endured more than we could ever imagine for our sake and we are encouraged to consider Him so that we will not grow weary and lose heart. On the Three Peaks Challenge and in life in particular we constantly face this temptation to grow weary and lose heart. I don’t know whether you know Jesus for yourself but either I encourage you to consider his example. With all the twists and turns of life for us over the past few years I could not be clearer in seeing that Jesus has helped us through it and brought us through the other side. The Three Peaks Challenge is surely over for another year but the challenge is to continue to take each day at a time with the grace that God gives us for that given day. Consider the summit, consider all that lies before us when we have finally run the face marked out for us. A third reflection is actually about the fact that this is a team challenge. I was so thankful to be welcomed me into the midst of such a great bunch of people and I really enjoyed getting to know them a little. My ‘moving time’ was actually well under the 24 hours. Indeed the driving & hiking times were easily on course to complete the challenge within the target period. And yet this was not solely my challenge, it was a team challenge. We could not move on to the next mountain until all the team were back from the previous hike. Unlike on previous attempts everyone did every hike – I was so impressed that no-one gave up! Hiking together is one of the real highlights of the challenge, it is good and motivating to share life together as we hike. Sometimes however there are periods when we need to be there for one another. In 2012 my friend Luke helped me on the descent of Snowdon (the Pyg Track); it is painfully rocky and when your legs are shot you feel anything but strong and stable as you come down (more like weak and wobbly). Care is needed and it takes time. I was grateful for Luke’s company 5 years ago and it was fitting this time around that I was called upon to play that same role for someone else as we came down Snowdon. At some stage we all need people in our lives who can draw alongside us, encourage us and just be there for us. Life’s challenges may well prove too much unless we have such friends alongside us! King David had someone like this in Jonathan and I would say that his best years were when Jonathan was alongside him. On one occasion in particular when David was under particular pressure we’re told that “Jonathan went to David at Horesh and helped him find strength in God” (1 Samuel 23:16). Who is there in your life who can draw alongside you to strength and encourage you? What a privilege to once again participate in this challenge. In many ways it is so gruelling but it is also hugely rewarding. I would even go as far to say that without some of these challenges it would not have been so rewarding! Of course it would have been nice to have completed Snowdon but that wasn’t to be.